"It's a hell of a long way from here to Chaco," says Steve Lekson, an archaeologist from the University of Colorado, as he sights along the north-south spoke of the cross. Follow his gaze 400 miles north and you reach Chaco Canyon in northwestern New Mexico, a major cultural center occupied from about A.D. 900 to A.D. 1150 by the pueblo people known as Anasazi. Despite the distance, Dr. Lekson believes the two sites were linked by an ancient pattern of migration and a common set of religious beliefs. But don't stop at Chaco. Continue about 60 miles northward along the same straight line and you come to another Anasazi center called Aztec Ruins. For Dr. Lekson the alignment must be more than a coincidence. A decade ago in "The Chaco Meridian: Centers of Political Power in the Ancient Southwest," he argued that for centuries the Anasazi leaders, reckoning by the stars, aligned their principal settlements along this north-south axis -- the 108th meridian of longitude. 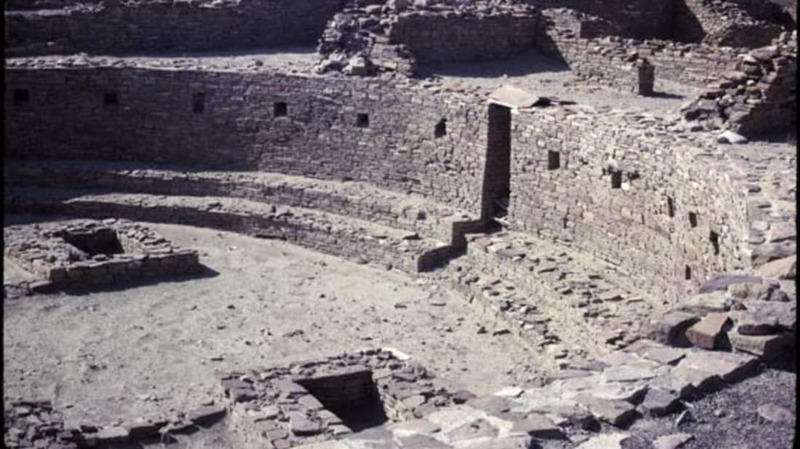 In an article this year for Archaeology magazine, he added two older ruins to the trajectory: Shabik'eschee, south of Chaco, and Sacred Ridge, north of Aztec. Each in its time was the regional focus of economic and political power, and each lies along the meridian. As one site was abandoned, because of drought, violence, environmental degradation -- the reasons are obscure -- the leaders led an exodus to a new location: sometimes north, sometimes south, but hewing as closely as they could to the 108th meridian.